★ Sound effects: get audio feedback when refreshing, swiping, and more. You can turn off Sounds easily in Settings. • Works great on the iPad Mini. • Added support for self-signed certificates. • Over 20 bugs and crashes fixed. I can vouch for the fact that the app does work very nicely on the iPad mini. I can also say that now that the WordPress app has been getting much more substantial and more frequent updates, it is becoming quite a useful app. I know that sounds little odd to say, but this app was hugely disappointing and not very useful at all for a long while. Over the last several months that has begun to change. I still don’t use it all for writing new posts – for that my go-to is the superb Posts app. But WordPress on the iPad or iPad mini is quite useful for things like comments moderation, viewing and working with the site admin dashboard, or making a quick post edit. I’ve used the WordPress on all my sites since 2006 and love the platform, so I’m very happy to see their iPad app has improved a lot and is now getting better all the time. 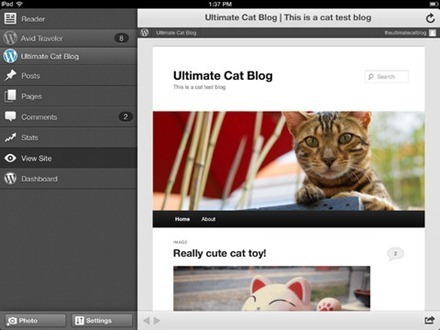 Here’s an App Store link for WordPress; it’s a free app and a universal app designed for both iPad and IPhone.